Patty had to admit that she was getting annoyed. Two of the female engineering students were always going to her husband Rob’s office for help with their homework. At first glance this would seem like a normal thing to do, as Rob was a teaching assistant for the materials science class they were taking as part of his PhD program at Ivy U. But they were there every day. And Patty could tell that they had more on their minds than materials science. This quote triggered the beginning of Patty’s relationship with hair dye. It didn’t help that Rob could not wear his wedding ring, because it was a danger in the experiments he was doing for his research. It had been off for so long that even the tan line had faded. To Rob’s credit, he was doing nothing to encourage any interest, but Patty wanted to set these two young girls straight. She had purposely not told Rob that she could not pick their twin sons up from daycare. She would do so when Justine and Jessica were in Rob’s office. She would know they were there, as they had to pass by her office on the way to Rob’s. Just then, they walked by. Patty gave them a few minutes and then she went straight to Rob’s office. She tapped on the open door and stuck her head in. “Honey, I forgot to tell you that I can’t pick the boys up from day care, I have a meeting with the Dean,” Patty said to Rob. “No problem. It’s way past my turn to get them anyway,” Rob responded. Justine and Jessica looked like they just found out spring break was cancelled. “Justine, Jessica, I believe you have met my lovely wife, Professor Coleman?” Rob said. After a few pleasantries, Patty left, feeling relieved. However, she decided Rob definitely needed a photo of her and the boys prominently displayed on his desk. They claim they can develop a prototype for $1 million. My gut tells me that they are dreaming. But, if I am wrong, it is too good of an opportunity to pass up. I’m hoping you can meet with Jan Curtis and Phil Anderson and come to a consensus on what the opportunity is. Let’s have Anderson write the report to reduce any extra workload on your part. BTW, thanks for helping my son at West Point. Fortunately he has inherited all of my wife’s good points and none of my bad ones! Patty continued to marvel in the change in Mike Madigan. Much of his aloofness and grouchiness had worn off. Patty then went and looked at the video and was blown away. Her first thought was, “I want one.” Then she went to the company’s website and saw that they had yet to make a prototype. She thought that the company’s request for donations was comically cute, but did not foster confidence. As she was mulling this over in her mind, Pete came to the door. “Hey Professor! Jan and Phil are coming to visit!” Pete exclaimed. As usual, Pete was a step ahead of Patty. Two days later, Jan, Phil, Rob, Pete, and Patty were in a small conference room at Ivy U. Patty forgot how much she missed them all and got a little misty eyed thinking about it. “Well Professor Coleman, what do you think about the Cicret Bracelet?” Phil teased. “I want one!” Patty joked loudly. “But, I’m not sure I will ever have one,” she continued. Figure 1. The Cicret Bracelet. Will it look this bright in sunlight? “It seems a challenge to get all of the electronics into such a small form factor,” Pete chimed in. “Can you even find an IC with dimensions as small as the width of the bracelet?” Jan asked. “I did a little checking and the new Apple A8 processor is quite small, a little less than 1 cm on a side. 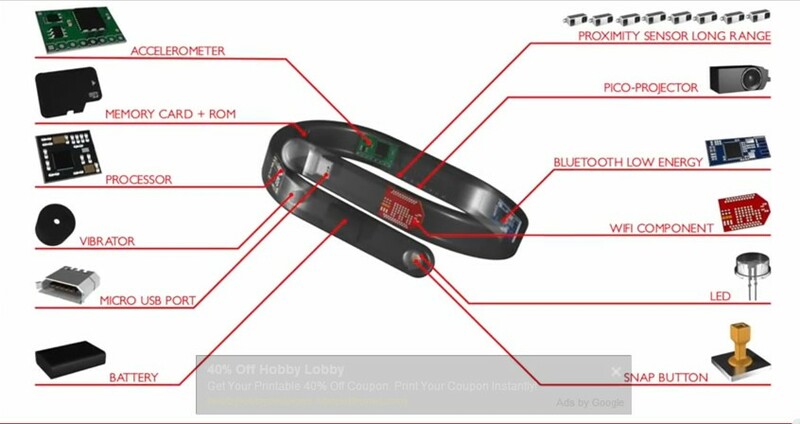 But that is about the width of the bracelet and some margin will be needed,” Rob added. “Let’s see if we can estimate the dimensions of the bracelet and compare them to an iPhone 6,” Patty suggested. The team went to different websites to get the answers. As usual, it took a little longer than expected. Within an hour, they had a summary. The dimensions of the Cicret Bracelet were 20 cm long, by 1 cm wide and 0.5 cm thick for a volume of 10 cc. The iPhone 6’s dimensions are 13.8 cm by 6.7 cm wide by 0.69 cm thick equaling a volume of 63.8 cc, over 6 times the volume of the Cicret. “I think we might be unfair in comparing the Cicret to an iPhone 6. The video doesn’t suggest it can do all that the iPhone does,” Jan commented. “Perhaps, but a factor of 6 in volume difference is a lot,” Rob responded. “The battery seems like a show stopper, the iPhone battery is 9.5x3.8x0.33 cm = 12 cc, more than the entire volume of the Cicret,” Patty said. While the team hashed all of these issues out, Pete obtained a teardown analysis of an iPhone 6. 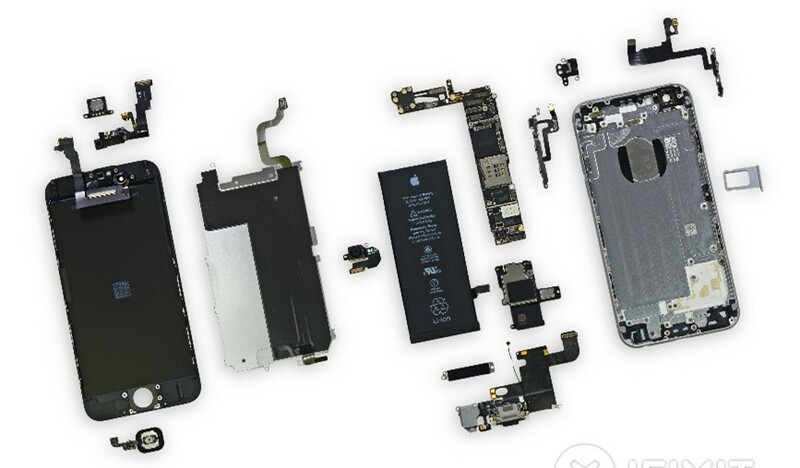 “Look at the teardown of the iPhone 6, it has more than 20 ICs. The Cicret has only about 5,” Phil sighed. 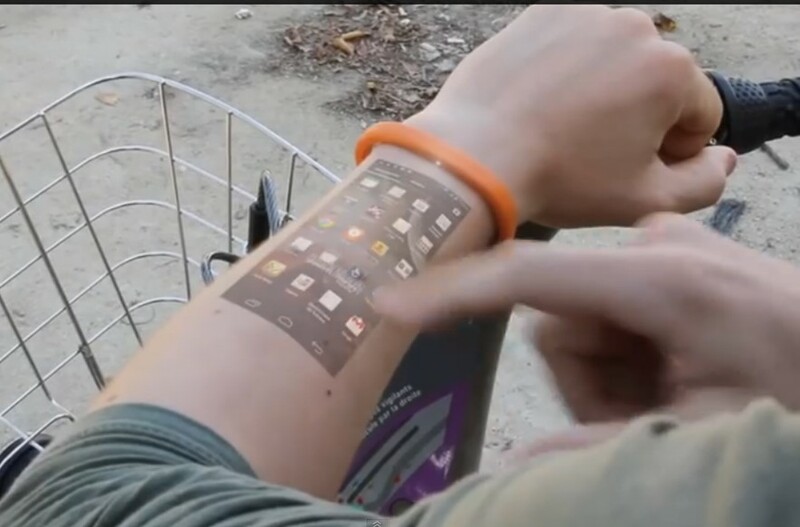 “To make the Cicret in its proposed form factor, one would almost surely have to work with IC and component vendors and have them develop special ICs and components to fit into the bracelet. This would certainly add to the cost,” Jan added. “Let’s see if we can summarize what we have learned,” Patty suggested. Since Phil was to write the report, he went to the white board and queried the team. The following summary resulted. The Cicret, at this time, appears to be a design concept. The videos were clever digital creations, not the viewing of a working prototype. The integrated circuits required are likely to be smaller than the width of the bracelet, as some margin will be needed. So, smaller-than-typical ICs will be needed. If this is the case, special ICs must be developed at considerable cost. The volume of the Cicret is 10 cc vs over 60 cc for a smartphone. Although the Cicret may not need all of the function of a smartphone, this volume difference appears to be too much. The volume for a battery, using current technology, will be the biggest challenge. Current battery sizes are greater in volume than the Cicret. The parts list that the Cicret offers appears to us to be too low. There are likely quite a few components needed that may not be listed. We question that the projector lights will be bright enough to be viewed in sunlight as the video suggests. One million dollars (US) seems to be a very optimistic cost to develop a working prototype in anything like the form factor shown in the video. Component and (especially) battery sizes will be issues. We think this cost could be off by a factor of 10 or more. These conclusions may be too negative. It would be helpful if one member of our team could visit Cicret to discuss these concerns. “Nice summary everyone,” Patty said. “Who will go to Cicret? It’s in France, right?” Jan asked. “How about Phil? Maybe he can at last find a girlfriend,” Rob teased. And with that the meeting ended.